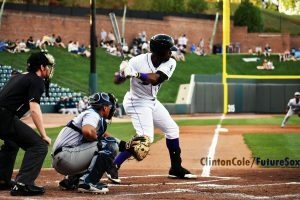 With players like Dylan Cease, Luis Robert, Nick Madrigal and too many others to mention, to go along with a potential Hall of Famer in manager Omar Vizquel, it’s not surprising that the Winston-Salem Dash led all of Advanced-A in attendance by drawing 292,744 fans including a ballpark record 9,011 fans on the 4th of July. With all of those marquee ballplayers, it’s also not surprising that the Dash won the Southern Division of the Carolina league by posting a first half record of 41-29 including a home mark of 22-13 qualifying them for the playoffs. A rash of promotions at the end of the first half did not slow down the Dash in the second half as they finished the season with a record of 84-54 for a .609 winning percentage with an astonishing 45-23 home mark. If you want to see winning baseball, BB&T ballpark is the place to be. Despite their regular season dominance, the Dash were swept out of the playoffs with three straight losses to Houston Astros affiliate Buies Creek, only one of which took place at BB&T. Perhaps they would have fared better if the series opened at their home park. 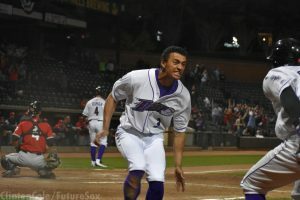 Fans found out early what type of season it was going to be when Joel Booker stole home in the 10th inning for a walk off win in the April 13 home opener. Here’s a breakdown of the more prominent prospects to be part of the Dash Roster in 2018. Nick Madrigal – The fourth selection in the 2018 amateur draft was quickly promoted to Winston-Salem after short stints in both AZL and Kannapolis. The first year player was most noted for his ability to put the ball in play, going 19 games before striking out for the first time as a pro on August 4. He did end up getting punched out five times in High-A. He slashed .306/.355/.348 with a .702 OPS without the benefit of a home run. Laz Rivera – The 24-year-old out of Miami and 28th round draft pick shocked the world with a jaw-dropping first half in Kannapolis. His numbers leveled off a bit at the higher level, but he still posted a solid slash line of .280/.325/.458 with an OPS of .783 and seven long balls. He needs to demonstrate more patience at the dish to earn another promotion. His age is also advanced for the level, but given his draft status, the organization should be pleased with his output and have put him on the AFL roster. Gavin Sheets – The second round pick in 2017 put up solid numbers over the course of a full season. He slashed .293/.368/.407 with an OPS of .776. He struck out 81 times while walking 52. At a power position, Sheets will need to escalate his home run production in order to make his way to the top levels of the system. He hit only six long balls, while focusing on his making contact, which was the focus on an early season article. Micker Adolfo – Limited to DH duties due to a UCL injury that eventually led to season ending Tommy John surgery, Adolfo clubbed 11 home runs in 291 at-bats and slashed .282/.369/.464 with an OPS of .883. Upon his return, he’ll need to focus on reducing the 31% strikeout ratio that he posted in 2018 and prove his health to be a candidate for the Double-A roster. Luis Gonzalez – The third round draft pick of the White Sox in 2017 surprised everyone but himself with a breakout 2018 campaign. Ranked as the number 22 prospect in the preseason, Gonzalez tore up the South Atlantic League earning him a promotion to Winston-Salem at the mid-point of the year. Leveling up did not slow him down as he slashed .313/376/.504 with an OPS of .880 and six home runs, which counter-intuitively exceeded his numbers at Kannapolis. All while playing a solid centerfield for the Dash. This season’s performance was not lost on FutureSox writers as he jumped nine spots to number 13 in our midseason rankings. In a crowded outfield situation, Gonzalez has emerged as one of the more intriguing prospects to watch, especially if he can hold down center field from a defensive standpoint. All this success makes it likely he’ll be playing in Alabama to launch the 2019 season. Luis Robert – In an injury-plagued 2018, Robert was limited to 37 games last season. After a brief stint in Kannapolis, which was delayed due to a wrist injury, he was promoted to the Dash. Unfortunately for Robert, 10 days after making the jump to Winston-Salem, he sprained a ligament in his left thumb (repeating the prior injury). This sidelined him for another four weeks. Upon his return, Robert disappointed at the dish slashing .224/.317/.309 with no home runs in August. His numbers declined further in a brief three games in September. On the positive side, Robert flashed some spectacular defense and blinding speed, which is enough for observers to remain bullish on his upside. Blake Rutherford – Rutherford benefited from playing the full season with the Dash. In 447 plate appearances, Rutherford slashed a solid .293/.345/.436 with an ops of .781 in 2018. He launched seven home runs while making consistent contact, striking out 20% of the time, which is considered average at the MLB level. This marked a major improvement over 2017, particularly in the power department. He remains a legit prospect in a crowded outfield situation. He needs to continue to upgrade the power numbers as a corner outfield slot is likely his final destination. Dylan Cease – What better way to start off this segment than with MLB Pipeline’s Minor League Pitcher of the year. In 13 starts for the Dash, Cease threw 71.2 innings striking out a whopping 82 against 28 walks with an ERA of 2.89, a WHIP of 1.12 and a batting average against of .204. These gaudy numbers earned him a promotion to Double-A Birmingham in Mid-June. On June 3rd, Cease posted one of his more notable starts allowing only one hit in six innings while striking out five. Tyler Johnson – Another hurler who appears destined for a long-term trip to Chicago is reliever Tyler Johnson. He was promoted to the Dash in late June, where he struck out 43 while walking only six with a batting average against of .172 and a WHIP of 0.88. With off the chart numbers such as these, Johnson will likely start next season with Birmingham as well. Blake Battenfield- Another mid-season import from Kannapolis who did not miss a beat upon being promoted. In 53.1 innings over the course of nine starts, Battenfield posted a 4.22 ERA with 46 strikeouts against 13 walks a .248 batting average against and a stellar 1.18 WHIP. He did allow ten balls to leave the yard and missed some time late to injury. Danny Dopico – The 24 year old right-hander made 32 appearances primarily out of the bullpen with a solid strikeouts to walks ratio 76 K’s vs. 26 BB’s, a 1.22 WHIP and .211 opponents batting average. He made one appearance at Birmingham as a spot-starter as well, and he should open 2019 there. Lincoln Henzman – The right-hander out of Louisville came to the Dash on June 24 making nine starts and 14 appearances with an ERA of 2.60, 20 strikeouts against 10 walks and a 1.27 WHIP. Alec Hansen – One of the few to arrive via Birmingham, Hansen struggled with his control all season long. Pitching coach Matt Zaleski is working with him to return to his 2017 form. For more on Hansen, take a look at the earlier post from FutureSox. A number of players performed well enough to earn promotions during the season (WSD statistics in parentheses). 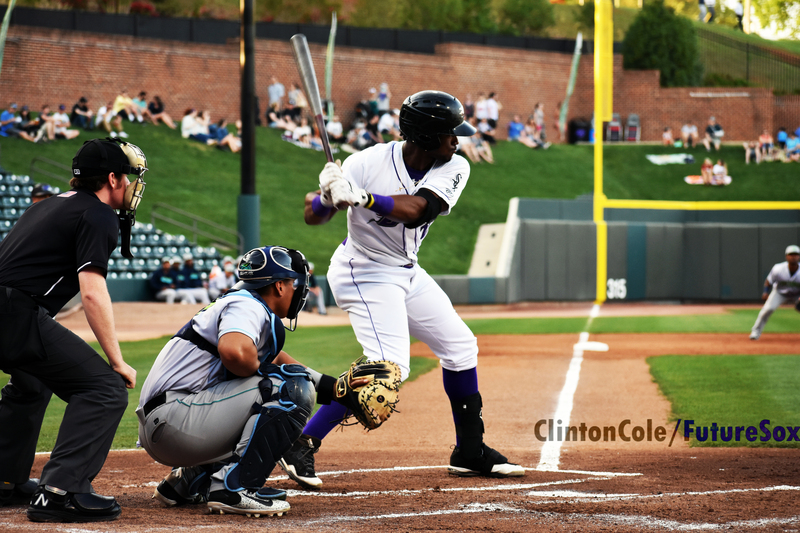 With number three and four prospects Luis Robert and Nick Madrigal likely returning (at least initially) to go with Micker Adolfo and 2017 first round draft choice Jake Burger coming back from injury by midseason, the Dash should challenge the attendance records again next year. Given his relationship with pitching coach Matt Zaleski, Hansen will probably return as well. In addition to these marquee holdovers, a influx of talent from Kannapolis is anticipated. Look for names such as Kade McClure, Carlos Perez, Michael Hickman, Justin Yurchak, Tyler Frost and this years’ second round pick Steele Walker to see time in Winston-Salem next year.